Preheat oven to 350°F (325°F if using a dark or non-stick pan). Grease an 8-by-8-inch baking pan and set aside. In a large bowl, whisk together cornmeal, baking powder and sugar. Stir in orange zest and cranberries. Stir in egg, milk, oil and butter until all ingredients are just combined (the batter might still be a little lumpy; this is OK). Pour batter into prepared baking pan and bake about 20 minutes, or until a toothpick inserted in the center comes out clean. Forget everything you think you know about cornbread. It’s about to get ca-razy up in here. 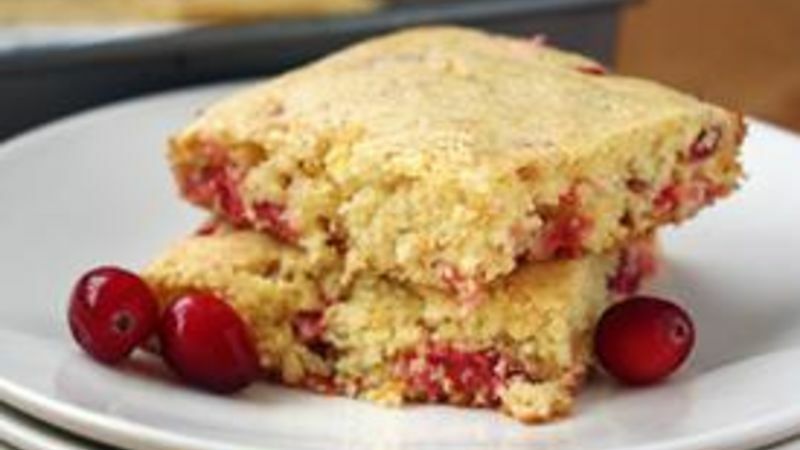 OK, maybe not that crazy – but it was crazy enough for me when I discovered the magic that is buttery cornbread juxtaposed with tart cranberries and sweet orange zest, like in this here Cranberry-Orange Cornbread. Who knew something so savory would taste so amazing mixed with something sweet? Me, I thought. I should have known that, what with my undying obsession with all things sweet and savory. Looks like I was just a little late to this particular couple’s party. I don’t know about you, but the flavor composition of cranberries and oranges rocks my socks off. It’s bright and cheery and delicious – the perfect ingredients to use in the dead of winter when everything else seems blah. And what I love most about this particular recipe is how these fruits shine, studded throughout the buttery cornbread, without being overpowering. And, bonus! You can have this mixed up and in your belly in 30 minutes flat. Winning. This cornbread goes fantastically with… well, pretty much everything. I’ve enjoyed it as a sidecar to spicy chili and savory stews, or by itself with butter and jam. And as with all cornbreads, in my opinion, it tastes even more phenomenal the next day. That is, if you can keep from eating it all before tomorrow.